Oh my gosh, if I look at one more colour swatch I think I may just explode! The amount of hours I have spent looking at hundreds of different paint colours is simply ridiculous. I find myself looking at them and they all just blend into one giant splodge. I am a terribly indecisive person at the best of times but when it comes to trying to decide of paint colours for 7 rooms; living room, dining room, kitchen, hallway, bedroom, nursery, bathroom.. I feel totally out of my depth. 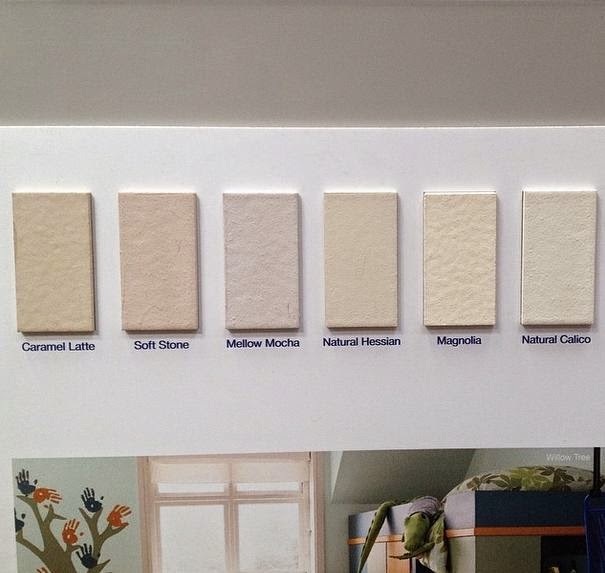 If it was simply deciding on one paint for one room then it would be fine but I need to pick 6 or 7 colours that compliment one another, are neutral but not boring, aren't too light or too dark and so on and so forth. 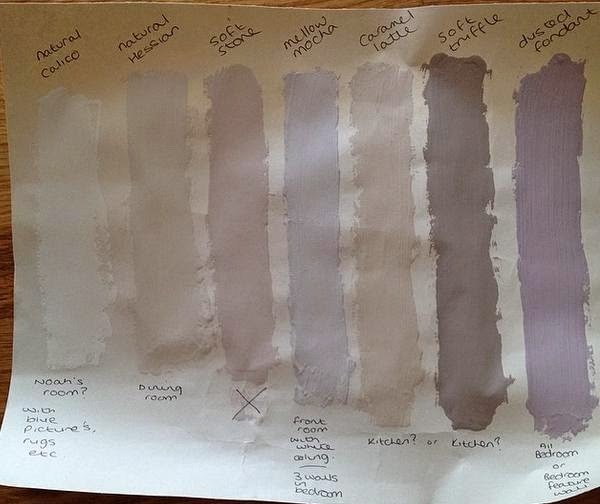 This week we bought half a dozen testers from Homebase to try out the colours for ourselves. We have rolls and rolls of lining paper at the house so I cut a bit off and painted it with each tester. I wrote the name above each shade to avoid any confusion. I also wrote down my initial feelings for each paint below each sample but I have changed my mind a little since then. I wish we had done this sooner cause paint colours look so much different in a catologue or on your computer screen. The colours also change dramatically when drying, some go lighter and some actually go darker, which was surprising. It was a good idea painting them onto the base they will actually be painted on once we choose as we can really see what the colour will be like. I also took the sample paper into every room in the house, in all the different lights to see how they would look. As you can tell I am a huge fan of neutral tones and going to add pops of colour here and there with accents such as picture frames, lamps, vases, rugs and so on. I'm really excited to get all the renovations out the way, have everything painted and then I can have fun furnishing each room. This is the plan for now but I am not 100% on the kitchen colour. Our kitchen has cream cabinets, oak work surface and will have white tiles so I need a colour that's darker than cream but is not too dark. It's really tricky. I want to go for a shabby chic/cottage feel in the kitchen and dining room so need a shade that is suitable. I wish I was brave enough to go for a lovely pastel colour or even a nice sage green, but I'm not, so I am sticking to my trusty neutrals. 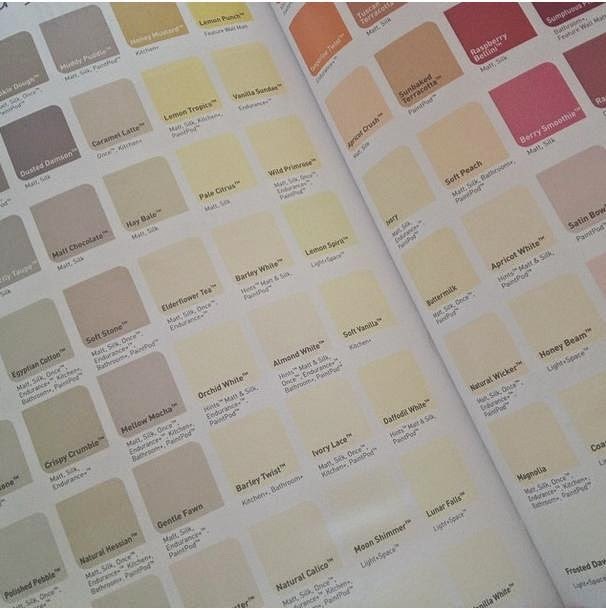 Do you have any favourite paint colours or any advice on what colour to paint the kitchen? We've had the house for just over two weeks (going up to three weeks now) we are still up to our elbows in it. Considering how many jobs we have to do we have done really well but at the minute our home resembles a derelict house as every room needed gutting. It's difficult to see past the holes in the floorboards, the smashed tiles on the floor and the totally bare walls but I know we are getting there. I like to think that seeing out home at it's worst will make us appreciate it so much more when it's done. Nick booked the week off work so we had the time to get really stuck in. My Mum also booked some time off work so then she could watch Noah while we went down to the house. There's only so much Nick and I can do without supervision and direction from Nick's Step Dad and Grandad but we did what we could. That being said nothing and I mean nothing went to plan this week. First off my cat hurt himself and we had to take him to the vets. It turned out he had dislocated and fractured his leg and needed surgery. It's suspected that a car hit him, the poor thing. 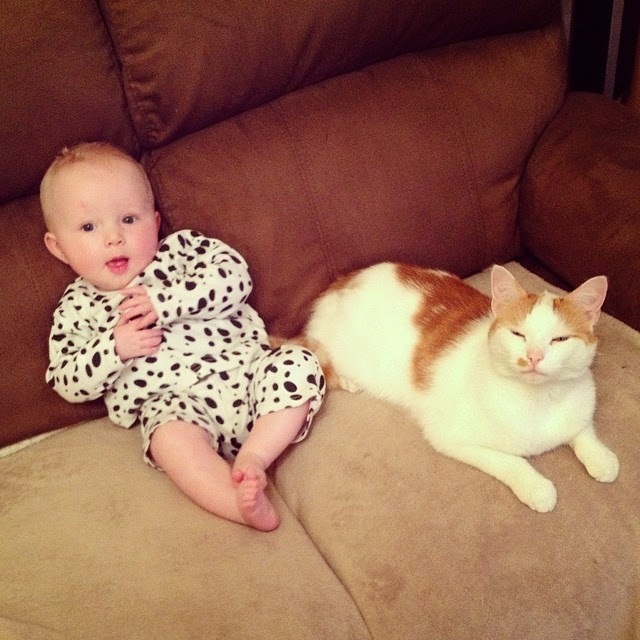 Thankfully we have pet insurance and the operation went well but we spent an entire day making sure the cat was okay. It was then my birthday so we had a day off from the renovations and so on. Everything just went against us this week. Things that were supposed to be straight forward and easy were just hardwork and difficult. It was just one thing after another which was far from ideal as time isn't on our side. We are supposed to be moving in at the end of the month! Amongst the ongoing jobs we have already begun we decided to throw another in the works this week, we started ripping out the bathroom. We went in with a hammer in hand and began smashing all the tiles off the wall. They came off really easy but to our dismay there was another layer on tiles underneath. The under layer of tiles are so hard to get off too. Not only this but whilst removing some tiles it pulled the plaster down with them so we also have a wall that needs re-plastering too! Nightmare! See what I mean about things going wrong? 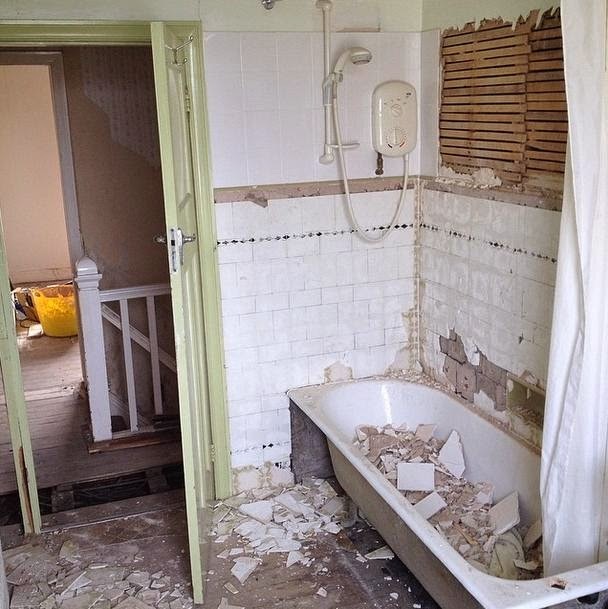 The bath, sink and toilet were ripped out the following day. The bath was cast iron and so heavy that it had to be sawed into pieces before it could be taken downstairs. 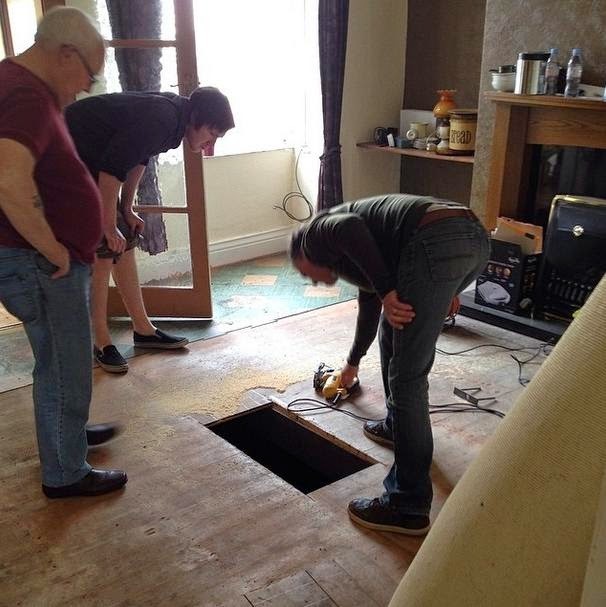 I was shocked that it hadn't fallen through the floorboards, it was that heavy! The lino was also removed and stunk of urine. It actually makes me gag going in there cause now everything has been taken out all the odors seem to have seeped out with them. 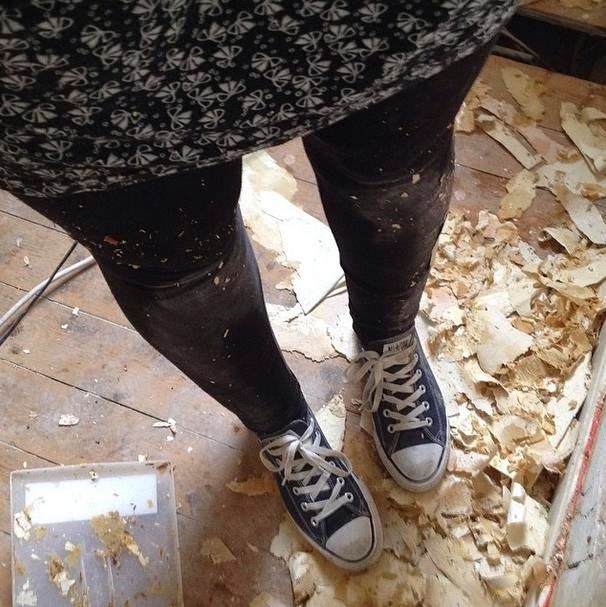 This renovation malarkey isn't very glamorous! We just need to get in now and remove the remaining tiles and the bathroom will be ready for decorating and it's new bathroom suite! I want to go for natural sandy coloured tiling and hopefully we will have enough money to tile the entire room. Not only that but the kitchen has come on a lot this week. 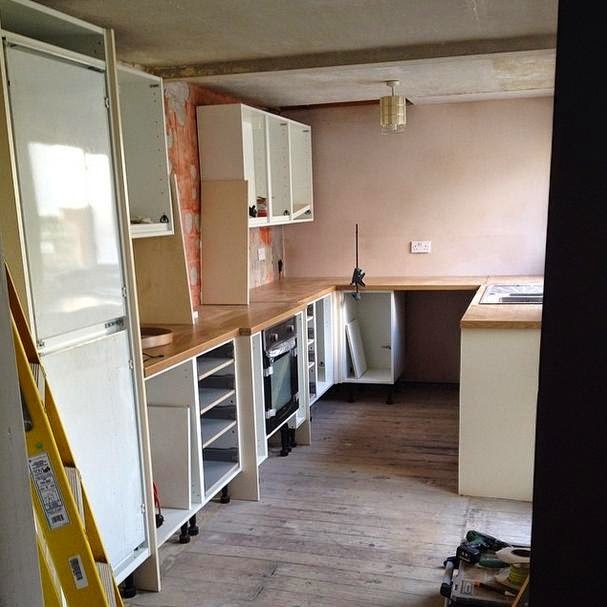 All the cabinets and cupboards are in place, the work surface is cut and secured, the fridge is in. Next up they are attaching all the doors and handles. I can't wait to see that. The kitchen is the most completed room in the house and it's good to finally be able to envision what it's going to look like. More rooms have been steamed and stipped too, there's not much to do on that front now. Some rooms have been papered with lining paper ready for painting. The rooms can't be fully done yet as the central heating needs to be installed first. 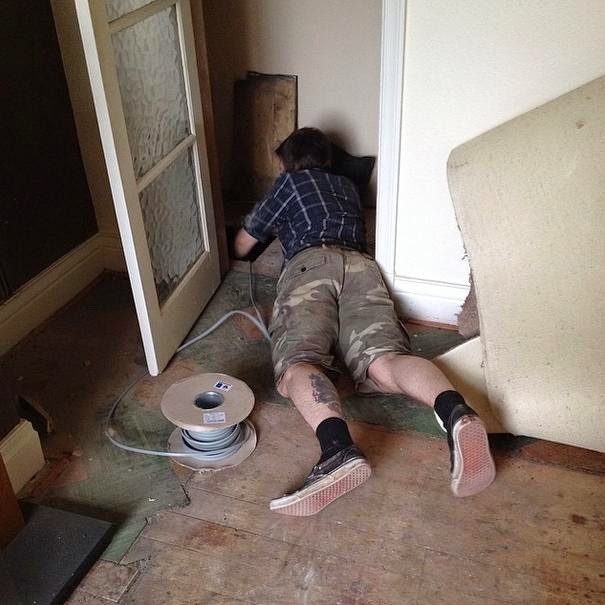 The rewiring of the house was continued this week too. I think we are almost finished with that. I don't understand it all to be honest. I just leave the electrician/Brother in law to it. We bought our new energy saving boiler and central heating system and that is all ready to be installed this week. It will be strange seeing the house with radiators. I can't believe the old chap who lived here before us never had heating! The photo's don't do any of the labour any justice. For example, you see a photo of ugly wallpaper, then it removed, then lining paper up and it looks pretty straight forward. Behind the scene's that's not the case. Sometimes the paper is really hard to get off, sometimes it's easy. You are using a steamer which turns the room you are in into a foisty sauna where you sweat silly. You scrape off a tricky piece of wallpaper to find a hole in the wall. If not that then you pull off some wallpaper and it pulls plaster off with it. You find a crack that need to be filled and evened out with filler. You find damp. It's endless. A job that should be straight forward and looks straight forward never is. It's tiring but we get so much help and we are so thankful for it. It's scary to think we are supposed to be moving in next week! That won't be happening! The thought makes me feel rather deflated but I have to take a step back, take another look and realise how much work has been done. Although we have a while left to go we have made a really good start. 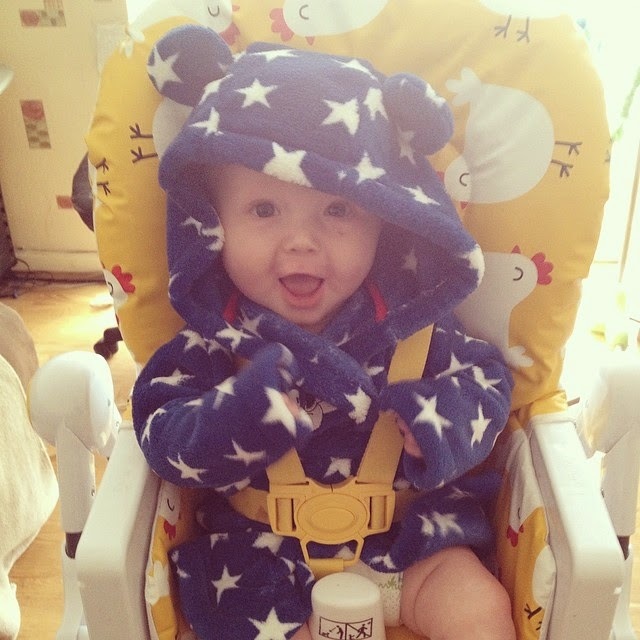 As you may know we chose to wean Noah at 4 months old as we believed it was the right time for him. 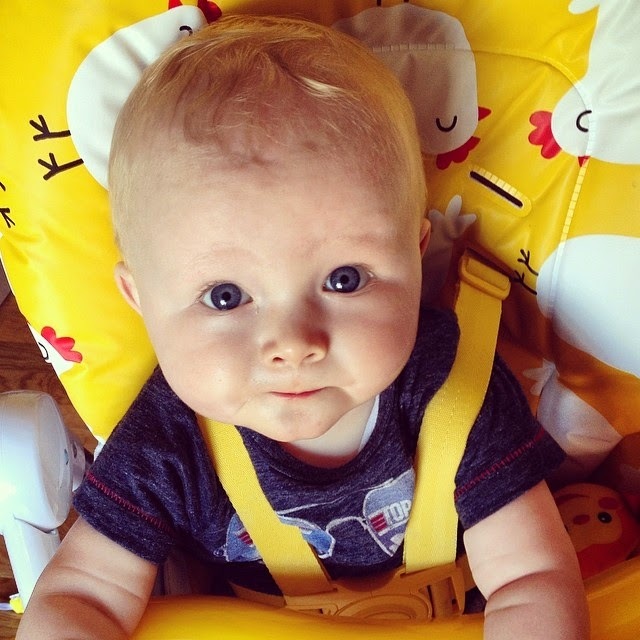 In that first month he only ate one meal a day, usually porridge or a veg/fruit puree and those solids didn't replace any milk feeds. In the 2 months following he gradually ate more and more and was introduced to many new flavours. From day one he showed a genuine interest in food. 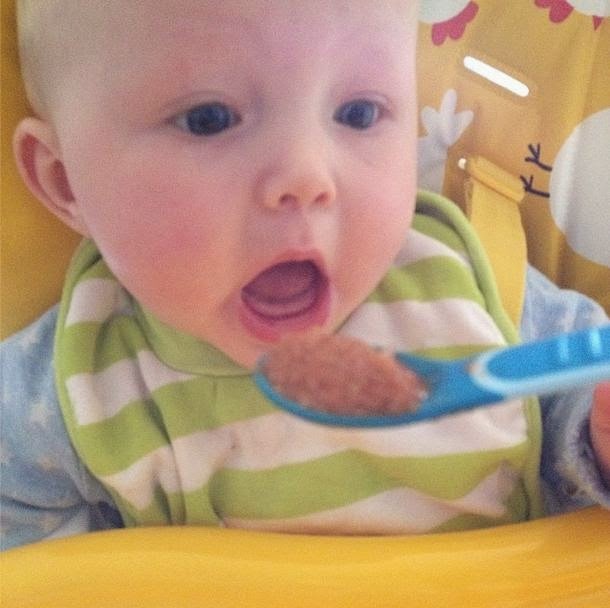 He knew what that spoon was the first moment he saw it, his mouth opened wide and to be honest it hasn't closed since! He really loves his food. Fry onions and garlic gently in a little fry light. Add mince meat and cook thoroughly. Once browned add chopped tomatoes, tomato puree and mixed herbs. Simmer gently whilst you wait for the pasta to cook. Once I had separated Noah's portion I added salt and pepper to ours. Serve and enjoy! Noah certainly did! I chose not to BLW Noah as I didn't feel comfortable doing so. Perhaps it's because I am a first time Mum and a rather panicky one at that. 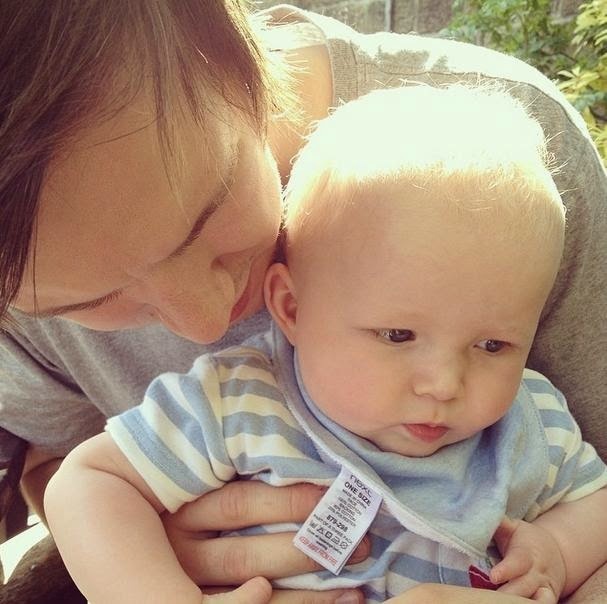 Maybe the next baby I will be a bit braver, who knows. So we've gone down the traditional route and so far it's working for us. 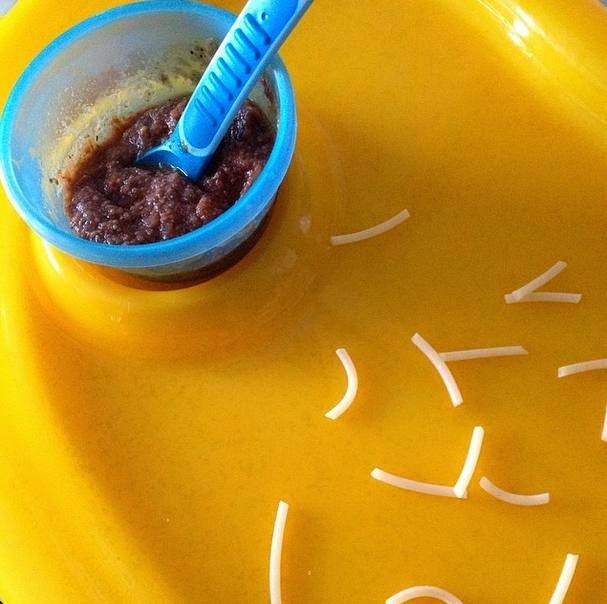 I decided to spoon feed the bolognese and let Noah explore the spaghetti. 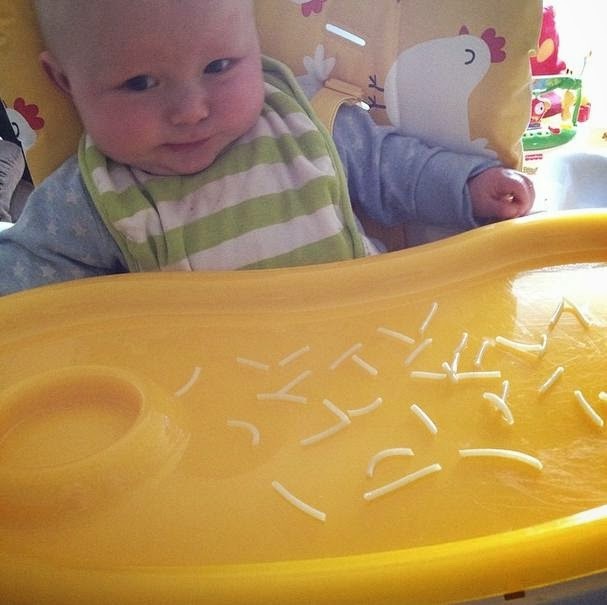 He was rather unsure about the spaghetti at first as you can tell by his expression. He would touch them and they would stick to his hands. He did try to put some in his mouth but next time I won't cut them as small so he might have a bit more success. 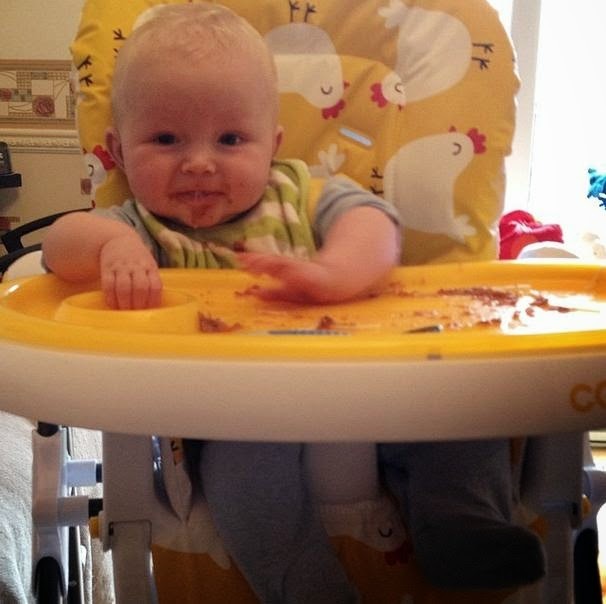 The bolognese went down a treat, he devoured it. I had blended it up for him but it was more like a paste rather than a puree. After he ate his fill we poured the remainder on his tray to let him explore and play with the food. I hoped he would try to eat some but he didn't. He just smushed it around with a rather disgusted look on his face. He will get there. All in all Mummy's spaghetti bolognese went down a treat! What where your babies first tastes? 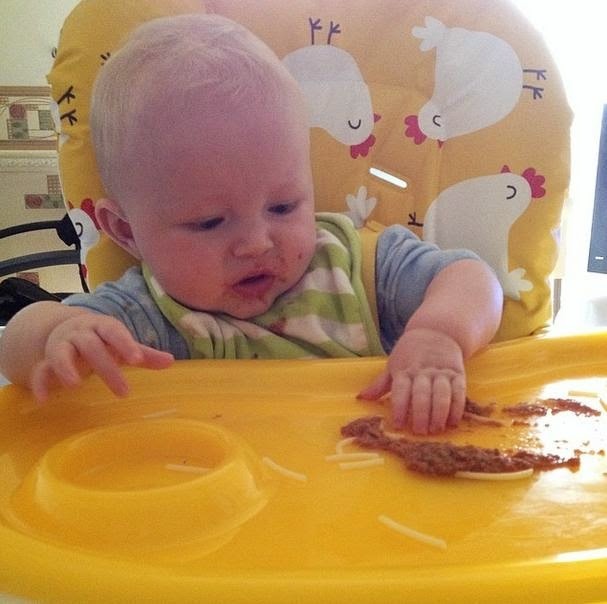 Did you go down the traditional side of weaning or did you try babyled weaning? It was my Birthday yesterday and the sun decided to put his hat on for the day. 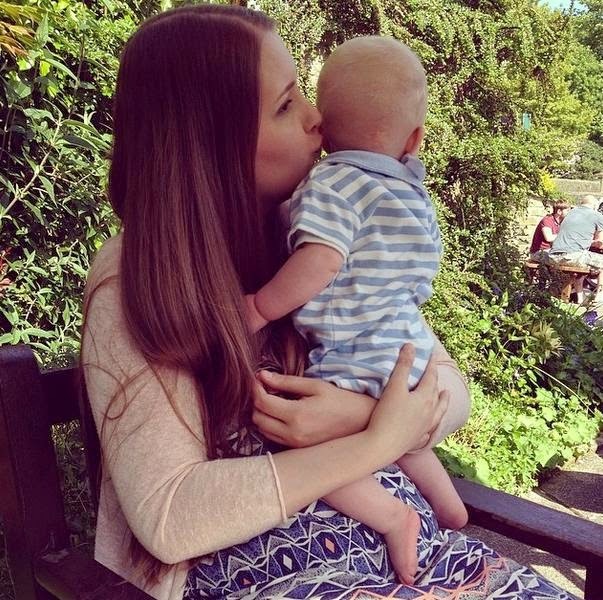 I turned 26 years young and celebrated my first Birthday as a Mummy! 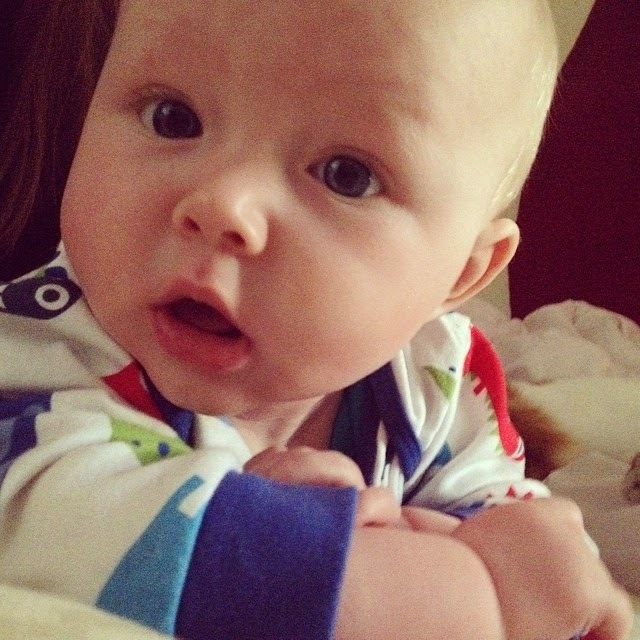 Noah and I had a lovely lie in together whilst Nick went out to buy a new boiler for the house. I then woke up to a bacon butty and a pile of presents, which Noah helped me open. He would of helped me eat my butty too if I'd of let him! We spent the morning in the house then got ready to go on a little walk. The walk was a silly idea really as it was far too hot to walk. It was that hot we should of sat lounging around with cold drinks in our hands. Noah did pretty well in the heat. 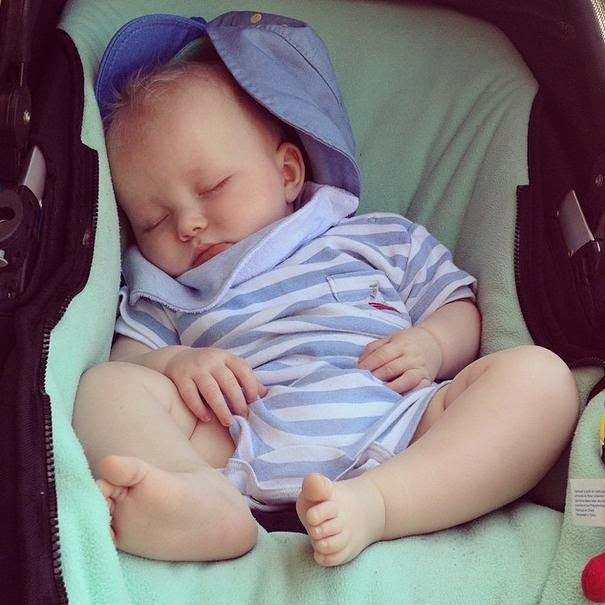 I slathered him in sun protection, sun hat on and kept him in the shade but the sun still wore him out. We then paid our Grandparents a visit for a welcomed cool down from the sun. Next up we paid one of our favourite posh pubs a visit. I ordered a cheeseburger and chips whilst Nick had a tuna melt panini, chips and salad. All washed down with Rekorderlig and Peroni. 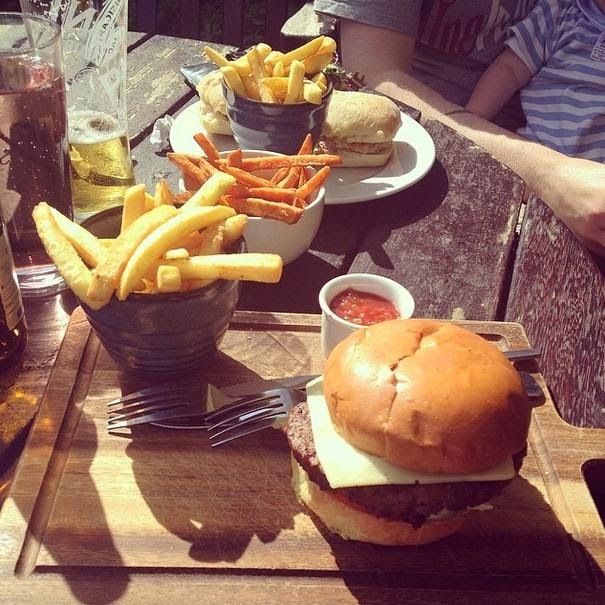 Perfect food and drink for the weather we are having. Noah was a good boy as usual and sat on our laps while we ate and drank. One of his favourite things to do is watch you eat, he is such a foodie and he finds it hilarious if you are eating at the same time as him. We then decided to go home to relax. It's so funny how the sun seems to tire you out. 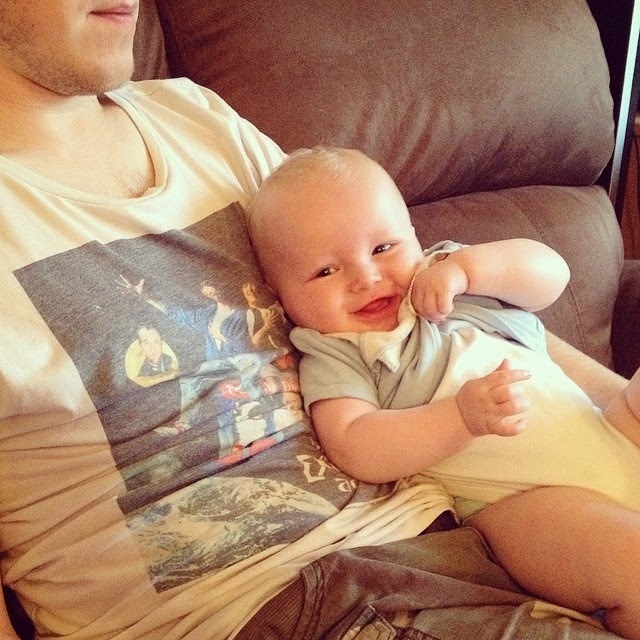 I stripped Noah to his nappy and we both fell asleep on the bed snuggled up together. We then woke up, spent a little more time together and got ready for bed properly! I wouldn't of wanted to spend my birthday with anyone or anywhere else. I had a lovely day. I cannot wrap my head around the fact that you are now 6 months old. It feels like only yesterday when you was born and we brought you home. 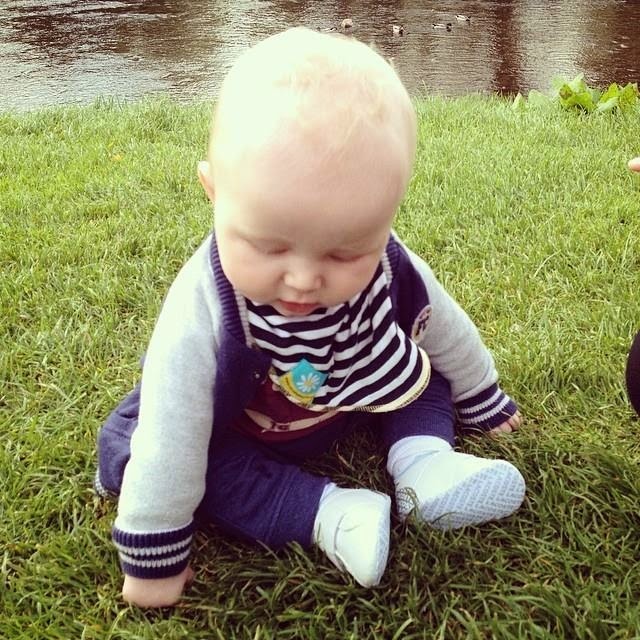 Now you are half a year old and you are not only starting to look so grown up but seem to learn something new everyday. It feels like I only need to blink to notice a change in you, it's so scary. I know I will look back at this post another 6 months down the line or in 6 years time and I will think time is still flying by. I didn't understand how fast time could pass until I became a parent. It's so bittersweet watching you grow and develop before my very eyes. On one hand I am deliriously happy seeing you learn a new noise, grow another curl or master a new trick but on the other it's sad because you are no longer that tiny little baby and it frightens me because it's all happening so quickly. I am scared that if I turn away I will miss something and I want to be there for every single first. I'm also frightened of forgetting the little things. I have such a bad memory and seem to remember a lot of unimportant moments but forget the moments I really want to remember. I thank god for technology as without my phone and photographs I fear I would forget bits and pieces but I find that the photo's really jog my memory. I just wish time would slow down, just a little bit. You have always been such a little character but this month your personality is shining. You are such a funny boy and you are so inquisitive. At the minute everything you set eyes on you want to explore, everything is interesting to you. You constantly have a smile on your face and that smile in contagious. I can feel really crummy for no particular reason and one smile from you and it dissipates. You are so affectionate too and are learning how to express it. You will touch my face, nuzzle into my neck or hold my hand. It honestly melts my heart. I never knew I could love so much. You may remember last year Natures Purest launched a competition to design a bib for its Hug Me Bear in support of Bliss, the special care baby charity. I blogged about it here. Well, the winner has been been announced, and it couldn't be more fitting! The winning design by mum Chloe White features the tiny newborn footprints of her two-year old son Oscar, who was a Bliss baby himself when he was born at just 27 weeks weighing 1lb 4oz. Chloe's design was came out on top in a vote on the Natures Purest Facebook page and 300 of the limited edition ‘Bears for Bliss’ have now been produced. All profits from the bears, made with 100 per cent organically grown cotton with no added dyes or chemicals, will go towards Bliss, giving vital support and care to premature and sick babies in the UK. You can buy them online at www.naturespurest.co.uk – but be quick! One of the first major jobs on our renovation list was to start on the kitchen. The old kitchen needed to be ripped out and gutted. All the cabinets, the tiles, the floor. You name it, it getting taken out! So the day after we got the keys we were straight in there. We needed a blank canvas for the new kitchen that we ordered just a few days later. This was the kitchen the day we go the keys. Very dated. So dated in fact it was last done in 1973, we found the kitchens receipt in the back of one of the cabinets. The day after we got the keys everything was gutted. All the cabinets and cupboards were ripped out, dismantled and taken to the tip. The tiles were hammered off the wall. All the waste was swept up and thrown away. 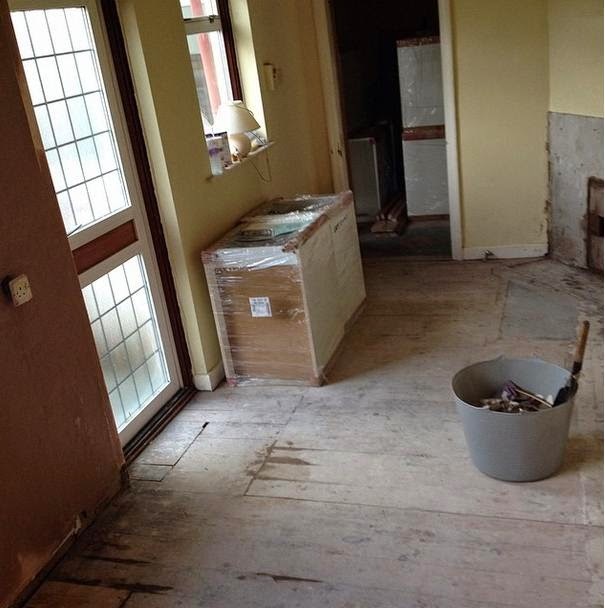 Kitchen floor was taken up. 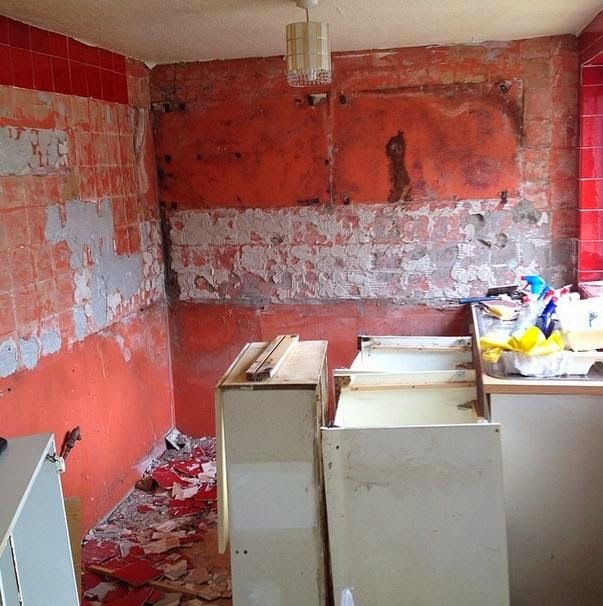 After everything was thrown out we finally see the kitchen's bare bones, stripped back to bare bricks. They found a bit of damp at the back of the cabinets so all the plaster needed to come off the walls. 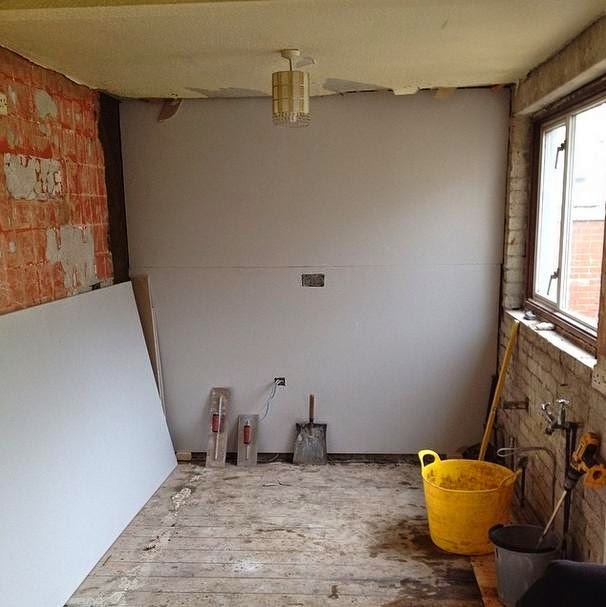 The back wall was then damp proofed and plaster board went up. The back wall was then plastered and Noah came to have a look at his house's progress, he was having a good nosey around. We were waking around the house with him and I lost my balance, nearly tripped and he started laughing his head off at me. He was so happy and smiley whilst we were having a look around. He must know that this is his new home, the house he is going to grow up in. There was an electric fire in the kitchen as the house has never had central heating. We didn't need that fire so it was taken out, sold and Grandad began closing it up. It was sealed with breeze block's then plastered but with a vent as air needs to circulate. The other side of the kitchen. It's a very long kitchen and not that narrow either but on pictures it seems to look smaller. Our new kitchen arrived today. We unpacked it all, attached the legs and set the frames up to where they are going to go which will make the fitting of the kitchen flow much more smoothly. 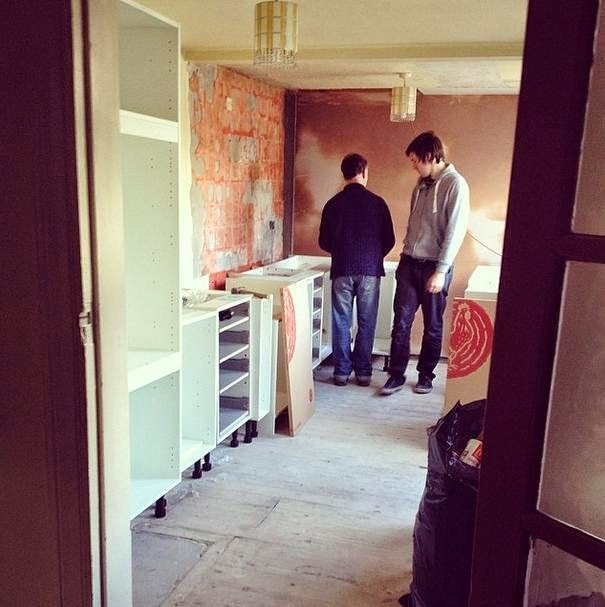 Hopefully by the end of the week our new kitchen will be fitted and we can begin painting, tiling and flooring the room! I'm so excited, I can't wait to see the end result! Happy half birthday baby boy. I say it every month but I can't believe it's been another month and how are you 6 months old already? These past 6 months have been the best months of my life. They have flown by, been hard work at times but every single day is filled with love and joy as I get to spend them with you. 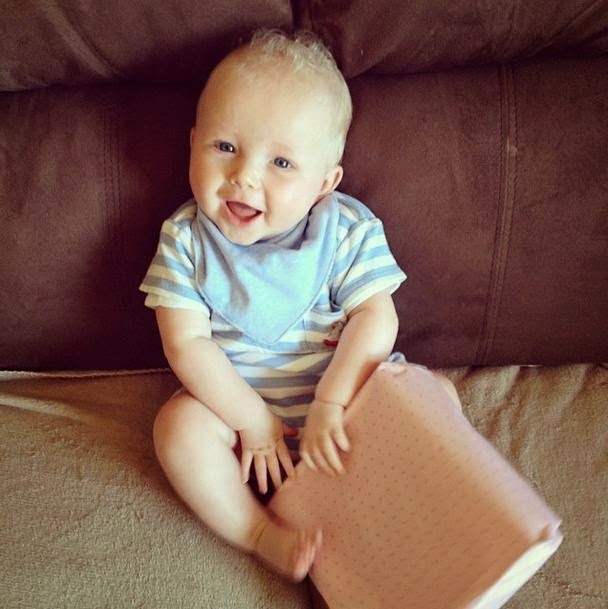 You are still one cheeky little boy. You are a very content, happy and smiley baby, you are a dream. There will be the odd day where you are aren't as cheerful but even on those days you are brilliant! I can't complain at all. You look at both Daddy and I with such love in your eyes and we only need to look at you to receive a huge gummy grin in response. You had been suffering with stranger anxiety for a few months but this month you seem to have overcome it. I try not to say that out loud as I don't want to jynx it but you have come on leaps and bounds. It's great to be able to see other family members getting to know you properly and enjoying you the way that we do without you crying. It was upsetting us both that people weren't getting to see the real you but now they are and they can't stop signing your praises. It's also amazing to see how your confidence has grown with other people and just in general. We are so proud of you. Last month I guessed that you were around 18lb but I think I was way off, I think you could be that now. You feel very stocky and solid but you are a long string bean. You have a few arm and leg rolls but only little ones, you aren't very chubby, not yet, You still fit in 3-6m vests, jackets and tops but the trousers in that size no longer fit as you have long legs. 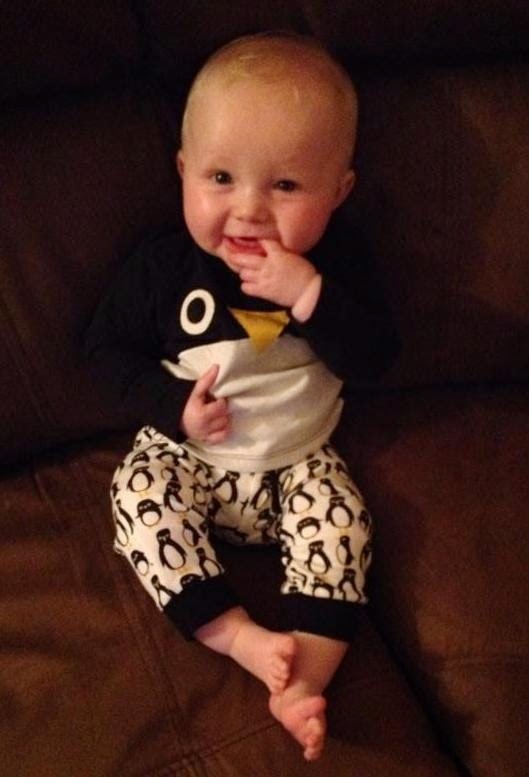 Babygrows in 3-6m fit fine on the body and arms but are way too small on your feet as they are rather long too. So your long legs and long feet are the reason why we have moved into 6-9m in some clothes. 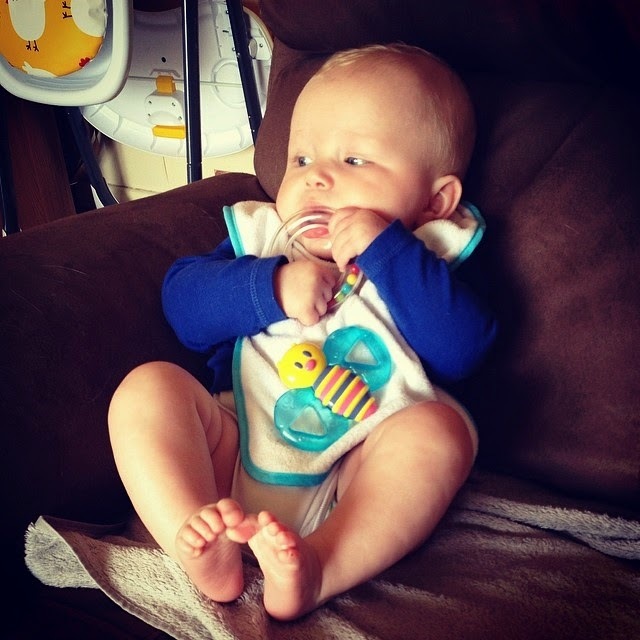 It's hard work and confusing when in two sizes especially to your Daddy! Again all good on the health front. You haven't even had a cold yet, touch wood. 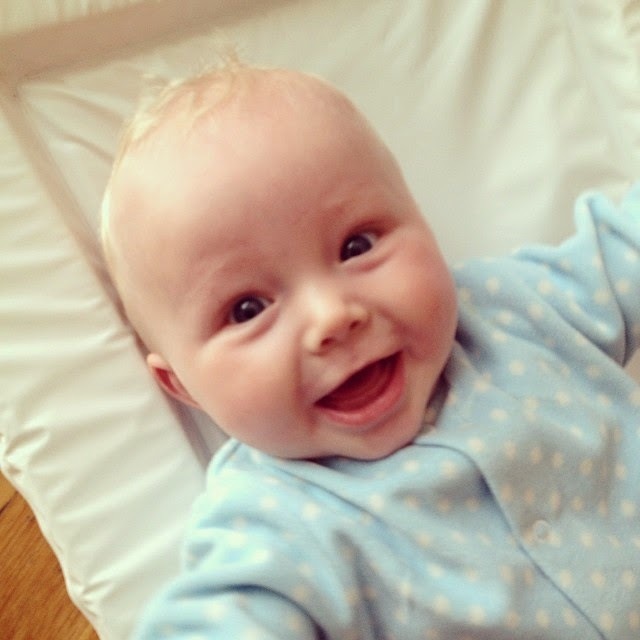 You seem to be teething but are dealing with it really well. I hope this means you are a good teether. You have been constipated on the odd few days but I figured out what was causing it, banana's. You love your banana's and I was giving you half a banana with your porridge for breakfast every morning. You now don't have them as much and you have been fine. I was making up 7oz bottles last month but we were wasting a lot of milk. I now make up 6oz bottles and you never drain them. You are having two meals a day, breakfast and dinner. Breakfast tends to be porridge and fruit. Porridge is your favourite food. For dinner you have a veg puree or a meal blended up followed by a pudding. I try to give you cooled boiled water with your food but you only manage an oz or two and then want milk. You still love your food and we are yet to find anything that you don't liked. 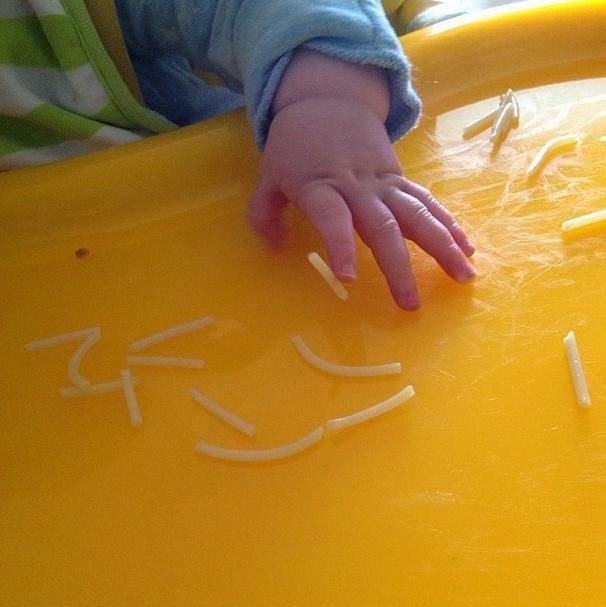 I am hoping this means you are going to carry on being a brilliant eater as you get older. 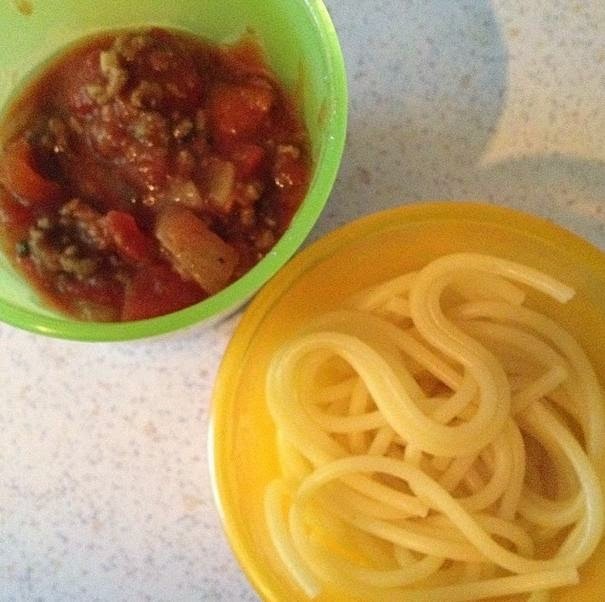 You tried meat for the first time last week when I blended up our homemade spaghetti bolognese, you devoured it. We have also introduced a few finger foods this last week; banana, spaghetti, biscotti but I still feel panicky about it. You have great hand eye coordination but when you are feeding yourself instead of sucking bits of the food off you literally bite off a huge chunk and I panic that you are going to choke on it. I know there's a huge difference between choking and gagging and that it's all a learning process but I can't help that it makes me feel this way. I know I feel more confident as time goes by and I don't let you see my worry. You still sleep great. Most nights it does take a few times to settle you but that is down to your dummy, it falls out, you want it back it. It's not a hassle but it's a habit we are going to have to overcome. You do have the odd night where you will wake up anytime between 4am and 6am for a bottle but then you will go back to sleep. You tend to sleep 8pm-9am, sometimes later. You sleep in your cot right beside my bed and I am guilty of bringing you into bed with me when Daddy has got up for work. You nap frequently throughout the day but only cat naps. I wish you just had one long nap in the afternoon rather than three 20 minute naps but at least you nap! - Laughing. You have been laughing for a few months now but we would have to tickle you most of the time to get one tiny laugh. On occasion you would laugh if we did something funny. Now you do it even when we aren't even trying to make you laugh. I tripped over yesterday and you ended up laughing your head up. - Confidence. You seem to have gained a lot of confidence with other people this month. When out and about you would be shy and reserved and sometimes cried. Now you give people smiles and chatter away to them. - Blowing. Not only do you blow bubbles but you just blow into thin air now and make a "puhh" noise when doing so. It's very cute. - Coordination. You are spot on with your coordination pretty much. When you reach for something its straight into your hand and then straight into the mouth. You now not only reach for things but push your body in the direction of the item that you want. - Vocal. You have been vocal from a young age and everyone commented on how well you were doing. Even though you have always been vocal there's times where you have a quiet spell and I really have to pry babbles out of you. This month lots more noises and sounds have come into your vocabulary. You have such an adorable voice. - Learning. Not only do you know your name but you are starting to recognise the odd word. Bottle, bok bok, dodo. It's amazing to see what you are learning week by week. - Sitting up. You are getting more steady and confident when it comes to sitting but I think we are going to be a while yet. You still can only roll front to back and are happy to be lounging around, you are very lazy. This month I am going to try to make you practice more. I know you are happy enough sitting on my lap but you need to learn Mr! - Movement. You can be sat in our lap or on the play mat and if there is something you want that is out of reach you make attempts at trying to reach for it. When you are sat on my knee and spot something that you want you will lurch forward to try and grab it. I now have to have a firm grip on you at all times! - Playing. You have always loved your toys but are finally really getting to enjoy them. I only have to place a couple of toys in front of you and I have made your day. - Awareness. You seem to be paying attention to every little detail now, everything is becoming more interesting and you want to explore it all. - Food. You have been trying a lot more different foods this month and you sampled meat for the very first time last week. I made you spaghetti bolognese and it was the first time you have had a "proper" meal with us. As in a meal I've cooked for Daddy and I and you have had some blended up (before I added any salt) So your first home cooked meal was spaghetti! I bet it tasted so much better than just veg puree's that I've been making you! - Mummy and Daddy. We are still your favourites, naturally. - Animals. Dog or cat when you see a live animal you get so excited and a huge smile appears on your face. - Food. You are such a foodie! Especially when it comes to banana's and porridge. - Other peoples food. It's begun. Whatever we are eating or drinking, you want it. When you notice we are eating you will stop whatever you are doing, even if you are drinking a bottle. You stop and reach out for some. Your Daddy was eating his tea the other night and put the spoon to his mouth, you thought it was coming to you so you sat there with your mouth wide open! - Teddy's. Any size, shape or colour. You love them all. They are good for cuddles, sucking, chewing, biting, wrestling and chatting! - Diet coke cans. This is a weird one and no you aren't having any! The minute you see us with a diet coke can your eyes light up, you get excited and want some. You don't get some. If you see a can on the table you will try to reach and grab it. If I put the can in front of you you will take it and attempt to drink it! Little naughty. You do this with most food and drink but especially with diet coke cans. - The mirror. You love to look at yourself and other people in the mirror, you find it hilarious. - My iPhone. You see it, you want it. - Cuddles in bed. One of my favourite things too. 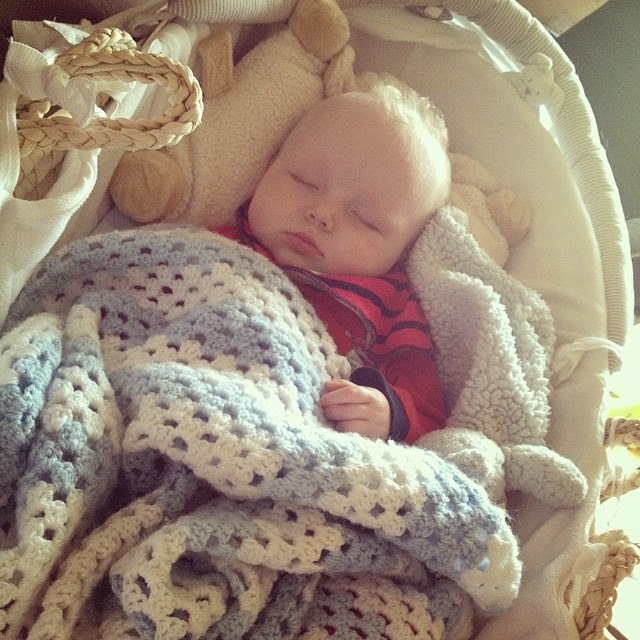 Whether we are sleeping or just relaxing, we love it don't we Noah. - Spongebob. You have been Spongebob mad from a few months old and you are still obsessed. As soon as you hear his voice or the theme tune you eyes are straight on the TV, transfixed. 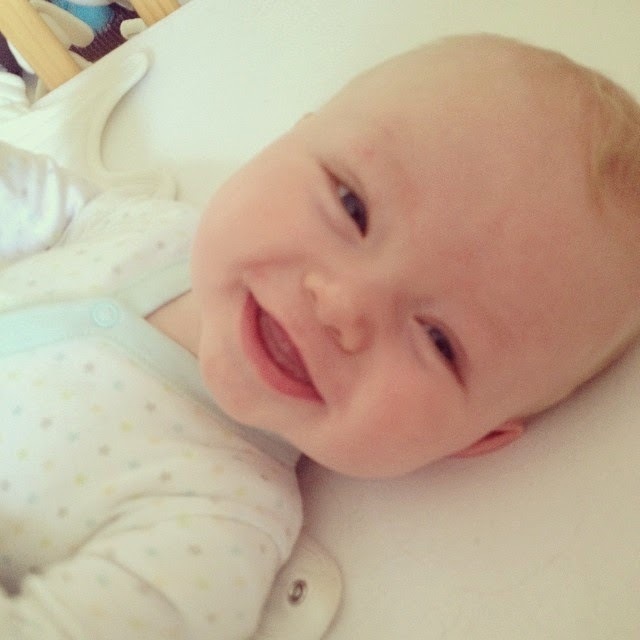 - Mummy and Daddy's laugh. When we laugh it makes you laugh and smile. It's amazing that you now associate laughing with a smile and laugh back. When did you learn that?! - Holding hands. You are a little cutie. - Sudden loud noises. I don't think the average adult likes them so it's no surprise that you don't either. - Getting dressed. Yes you still hate your arms being put in those sleeves. - The car. You used to love the car but now you tend to get bored easily and want out. - You don't like it when we walk out the room and leave you even if it's just for one second. You don't cry but you will call out or shout at us. When we come back in you give us a great big smile. I hope this next month doesn't fly past us so quickly as at this rate you will be 1 year old before we know it. You make us ever so proud every single day and are the best thing that has ever happened to us. We love you so much. Well where do I begin! We've now had the house for 10 days and almost every day we have been down there working on something or other. It's been none stop! We have so much work to do in so little time, there's no time for dawdling. 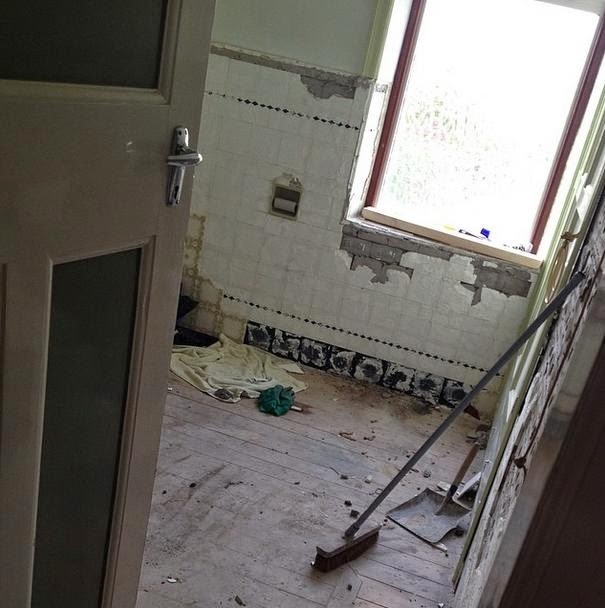 The house looks derelict and absolutely awful at the minute as every room is in the process of being gutted. I like to think that seeing the house right now at it's worst will make us appreciate it so much more once it's done. We move in at the end of this month and although we don't expect all the work to be done it would be good to have the majority of it out of the way before we do. 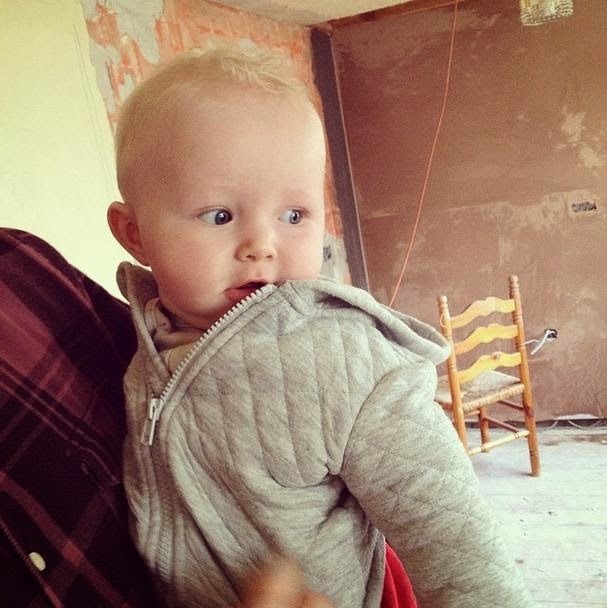 I don't want the house to be a building site once we are in there, it would be a nightmare with the baby! Going into this we had a huge list of jobs that needed to be done and to look at it was so daunting. We have made a good start on everything but the minute you tick one job off the list a new job appears. 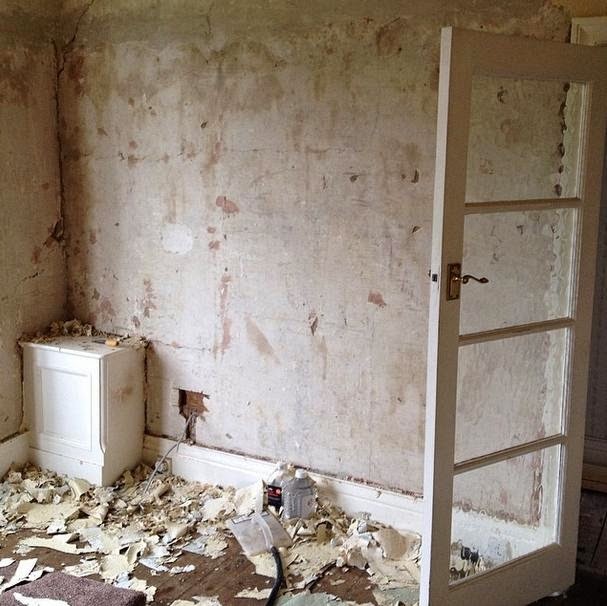 For example we will take some wallpaper off to discover a hole in the wall! Still we would rather see these things now before we redecorate and move in, that would be another nightmare. 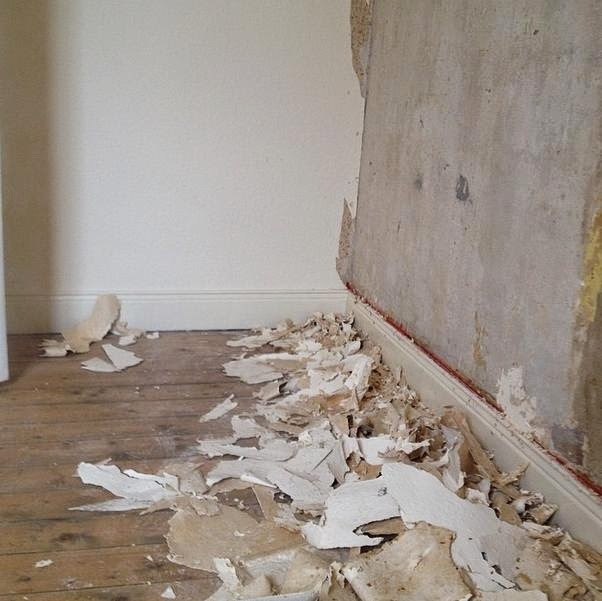 I have mainly been steaming and stripping wallpaper. Nick's Mum has come to help on a couple of days which has been great! 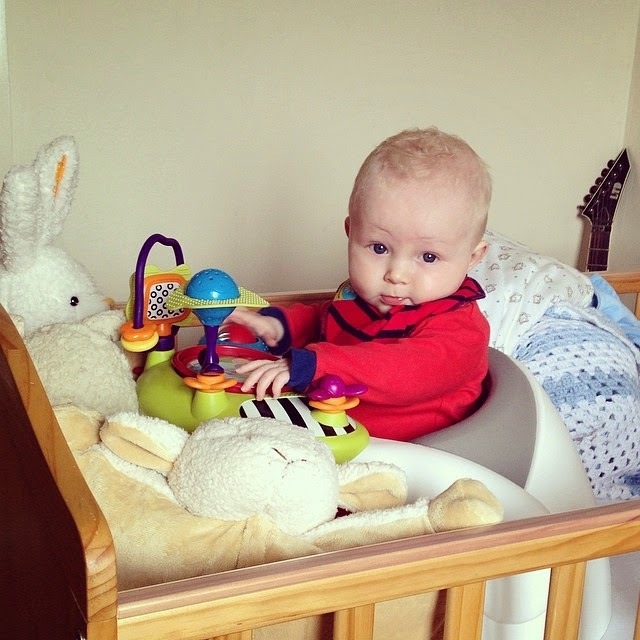 So far we've done our bedroom, the nursery, the hallway, half the landing and the front room. 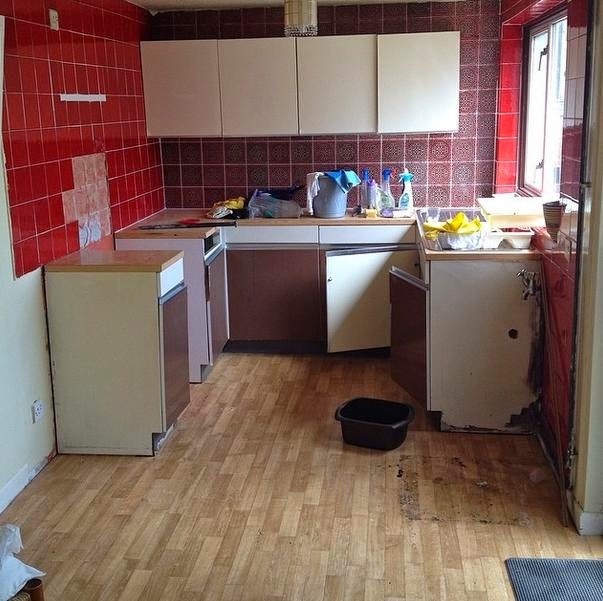 Which leaves us with the kitchen, dining room, box room and bathroom to do as the entire house needs stripping and redecorating. 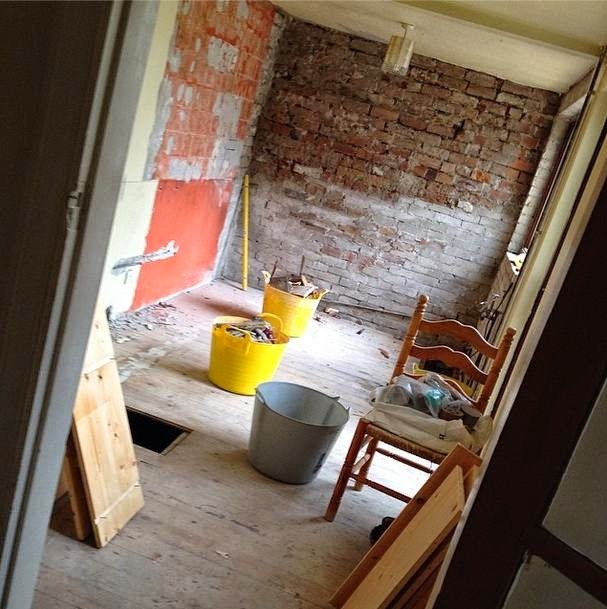 We can't start on the bathroom until we have the old one ripped out and we can't really start decorating yet as we are still waiting for the central heating system to be installed. 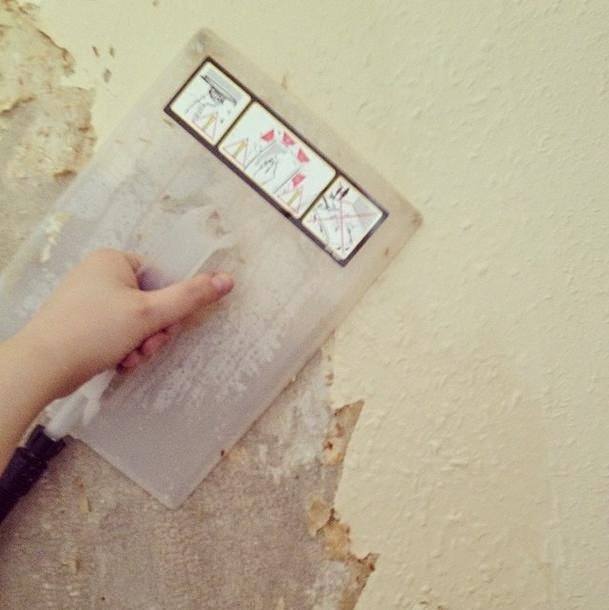 I have to say I am getting rather fed up of scraping wallpaper off but it needs to be done! I think I will throw a party when it's finally all off! Nick has been the laborer of sorts, helping out wherever he is needed. Stripping walls, clearing up, trips to the tip, odd jobs here and there. He is terrified of spiders and we keep frightening him by telling him we need him to go under the floorboards to sort out the wiring, ha ha. Nick's step dad has been a godsend. He's renovated dozens of houses in the past and is one of those people who can do everything! 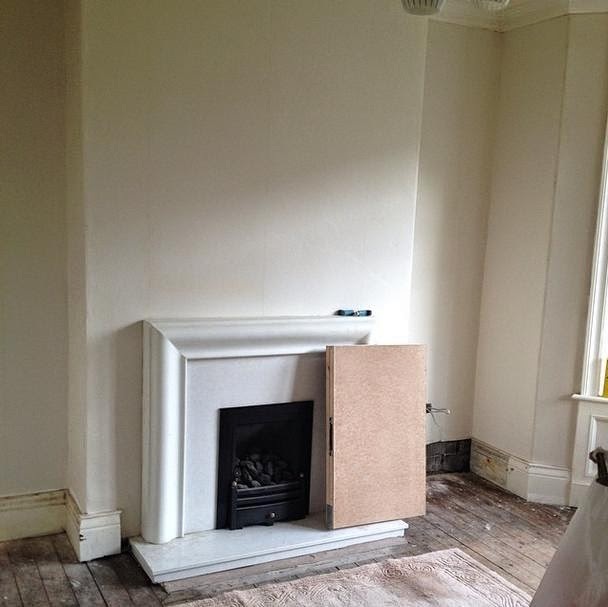 So far he has started the house rewiring, removed rotten floorboards and replaced them with new, damp proofed and plastered the kitchen and so much more. He is about to start fitting our kitchen too, which arrived today! We've also had lots of help from Nick's Grandad too. We will turn up late on in the morning after we have sorted Noah and he will of already been there hours. 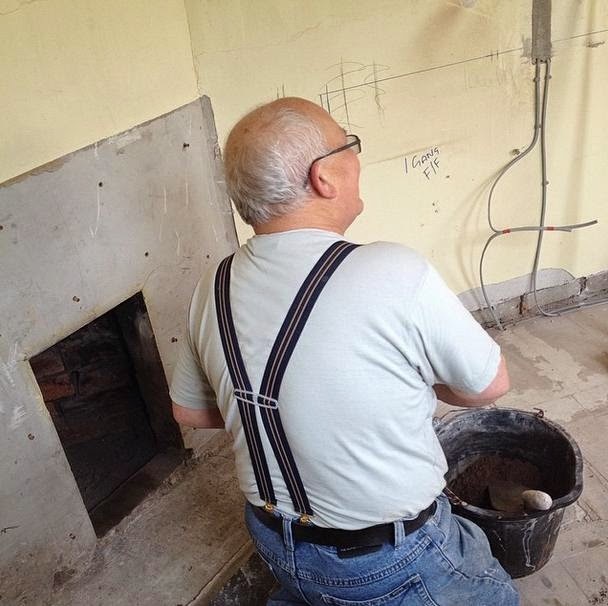 He ripped out the old kitchen, he's been plastering and filling holes in the walls, blocking old fireplaces and countless other jobs. You wouldn't think he was coming upto 80 years old. We keep reminding him to take it easy but he loves it, he won't hear it. We are extremely lucky to have a lot of help from our family cause if we didn't have this help we wouldn't of gone for this house in the first place. If we hadn't of gone for this house then we wouldn't have our foot on the property ladder as there is literally nothing suitable for sale at the moment! I keep looking and I am so thankful we found this house and looked past all the renovating that needed to be done. It's going to be a lovely family home. I have been reviewing Degustabox for a few months now and each month the box just gets better and better. If you are new to Degustabox, then let me explain..
Degustabox is a subscription box for foodie lovers everywhere. 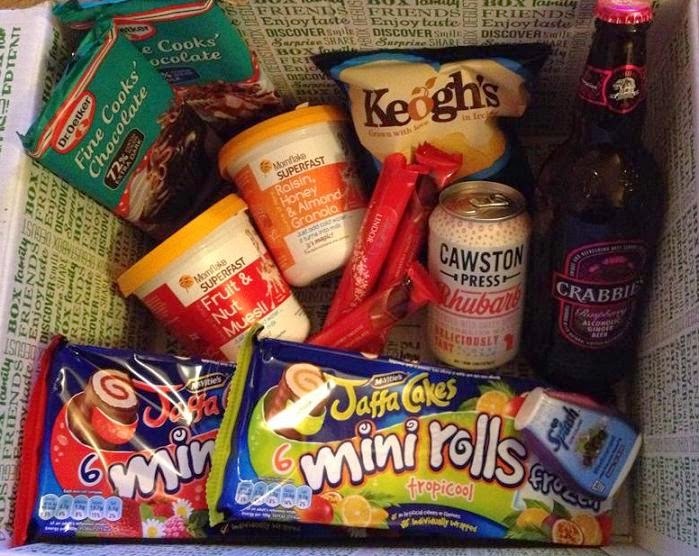 Each month you receive a box full of brand new and exciting food products, all for £12.99. It's ideal if you love to discover new foods and tastes. 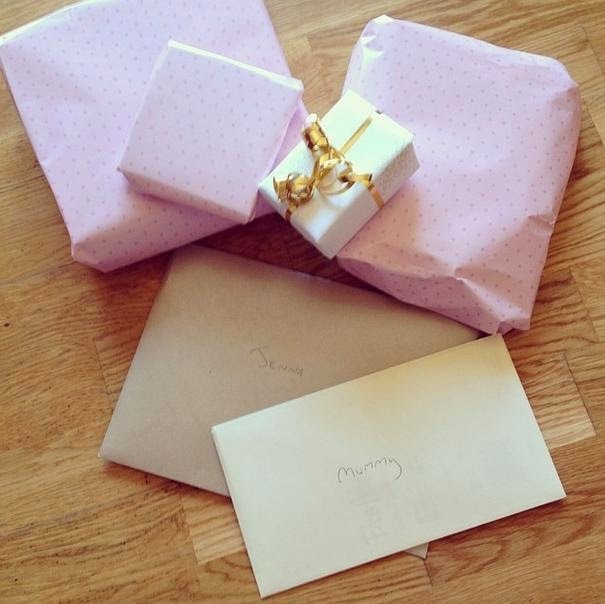 If you aren't to keen on receiving a surprise you ca tailor the box to your personal preference instead. Dr. Oetker Cooking Chocolate x2: I haven't baked for a while now but on seeing these Dr. Oetker products in the box it made me want to bake some muffins or a huge chocolate cake. Crabbies Raspberry Alcoholic Ginger Beer: I was plesantly surprised to see Crabbies Alcoholic Ginger Beer in there. We love Crabbies and my other half didn't waste any time in sampling it. It was divine! Clearsprings Miso Soup x2: We haven't tried these yet but they do look interesting. Lindt bars x3: Oh my days. Lindt is one of my favourite brands of chocolate and I enjoyed these way too much. It was nice to see them in bars! Such a rich and creamy chocolate, yummy. Go Splash: This is a very concentrated fruit squash which can make up to 6 litre's of cordial. Low calories and no added sugar. I received the blackcurrant variety, it's lovely. Cawston Press: Rhubarb blended with sweet apples and sparkling water. It's a lovely sweet and sugar filled pop. The taste is divine and reminds me of rhubarb and custard sweets. Very high in sugar though. Keogh's Crisps: I love my crisps and could easily live off them. I hadn't tried Keogh's before and on trying these sea salt and vinegar variety I was very impressed. Quite possibly my new favourite crisps! I just wish there was more than one bag in the box. Mornflake Granola & Mornflake Muesli: These cereal pots are great for on the go. All you need to do is simply add cold water and they are ready! Perfect for busy mornings. McVities Jaffa Cake Mini Rolls x2: We received the Tropicool and Berry Burst varities and both were delicious. A great twist on the mini rolls. It says on the pack to pop them in the freezer for a frozen treat. Again Degustabox haven't failed to disappoint. Each month they just get better and better! A great mix of products and great value for money. I am very impressed! I would hesitate in recommending Degustabox to everyone! If you want to sign up yourself then feel free to use this code: 9EZP6 at the checkout to receive a £3 discount.